Scientists from the German Centre for Neurodegenerative Diseases and the DFG-Center for Regenerative Therapies Dresden have identified two proteins, interleukin-4 (IL-4) and STAT6, that appear to play important roles in the Alzheimer’s disease process. Their study (“IL4/STAT6 Signaling Activates Neural Stem Cell Proliferation and Neurogenesis upon Amyloid-β42 Aggregation in Adult Zebrafish Brain”) appears in Cell Reports. The research in the laboratory of Caghan Kizil, Ph.D., used zebrafish as the animal model because it has the ability to replenish lost neurons after various types of damage. The team demonstrated that the zebrafish could also so after Alzheimer-like neurodegeneration, something humans are unable to do. “We believe that understanding how zebrafish can cope with neurodegeneration would help us to design clinical therapy options for humans, such as for Alzheimer's disease. 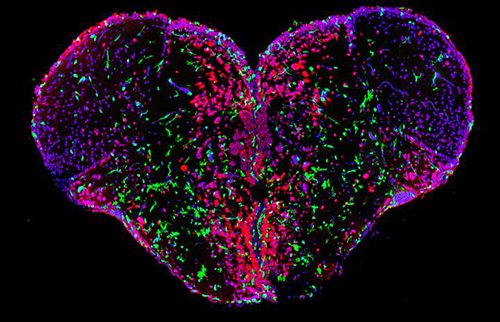 Within this study, we observed Alzheimer-like conditions in the fish brain. We found that zebrafish can impressively increase the neural stem cell proliferation and formation of new neurons even after Alzheimer's-like pathology. To treat Alzheimer's we need to generate more neurons. And this all starts with neural stem cell proliferation, which fails in our diseased brains,” explains Dr. Kizil. This study has shown that Alzheimer's disease symptoms can be recapitulated in the zebrafish brain using a short section of the human amyloid precursor protein (APP) that is a hallmark of Alzheimer's disease (amyloid-β42). This protein causes the death of neurons, inflammation, loss of neuronal connections, and deficits in memory formation in zebrafish. Dr. Kizil's group found that the immune-related molecule IL-4 is produced by the immune cells and dying neurons in the fish brain. This sends a signal to stem cells to proliferate through a cell-intrinsic mechanism involving another protein of central function called STAT6. The importance of this study lies in the notion that the diseased brain and the inflammatory milieu can be modulated to kick-start neural stem cell proliferation, and this is “exactly what successfully regenerating vertebrates do,” notes Dr. Kizil. “We will go on identifying more factors required for a successful 'regeneration' response in fish brain after an Alzheimer's disease-like situation. By doing so, we can get a more complete picture of the molecular programs beneficial for tackling this disease,” he says.